We use globally recognised premium Creapure® raw material made exclusively in Germany. The trademarked quality combines maximised purity and maximised efficacy with a perfectly balanced dosage. Conventional creatine monohydrates are imported from China and display poor biocompatibility and insufficient solubility. Quality Creapure, on the other hand, creates a crystal clear powder with the highest degree of purity. Dietary food for intense muscle exertion, especially for athletes. A varied and balanced diet and a healthy lifestyle are essential. Only suitable for adults who engage in intense physical activity. Positive effects can be observed from a daily intake of 3g of creatine. May contain traces of gluten, egg, soy, and milk (incl. lactose). good help for my workout. super. I like the powder. It´s easy to dose and drinking it with juice is good. I drink creatine regularly with juice. feels like i don´t get sore muscles that much and feeling pretty strong. I have never enjoyed taking capsules so this powder form is perfect. Easily soluble in juice or water. Will buy it again. High-quality product that my body seems to handle very well. I tried different creatine powders before, but this one is definitely the best. You won me as a new customer foodspring and I am curious about trying your other products as well. Definitely like this product to support muscle growth and take it before I go to the gym. It does make a difference. Who should use creatine powder? Creatine powder is one of the most commonly used supplements in muscle building. It is widely used in competitive sports but is also gaining traction at grassroots level due to its effects. Creatine is at its most effective within the scope of quick intense workouts which makes it suitable both for weight training and team sports. The efficacy and biocompatibility of creatine powder is closely linked to the quality of the raw materials. In the world of creatine powder a large number of inferior monohydrate products produced in Eastern Europe or Asia can be found online. It is not uncommon to find impurities in these powders. Poor production conditions can lead to the occurrence of degradation products in the creatine powder, like creatinine, dicyandiamide and dihydrotriazine, meaning the powder can no longer be effectively absorbed by the body. In Germany, production and manufacturing processes for Creatine powder are subject to strict regulations. The German manufacturer Creapure® is the premium brand for creatine powder and a worldwide market leader. Creatine powder can help you increase your strength and gain weight and take your training to the next level. The increase in strength is most noticeable during hard, complex exercises like deadlifts, bench presses and squats. Creatine powder is ideal for anyone who wants a new stimulus to break the stagnation of a lull in training. Taking creatine powder increases strength within the scope of quick, intensive workouts (power training). Numerous studies show that creatine powder can increase endurance and maximised power. This improved performance and power enables important muscle building processes to occur quicker and more effectively. Creatine also improves glycogen and water storage in the muscles. As a result, weight gains of 1 - 2 kilos can be observed in a short space of time. The first step to bulging muscles. You can find additional information on our page about the effects of creatine. Creatine powder is primarily competitive sportsmen and weight lifters who want to improve their performance. Footballers can use it to maximise their sprinting while weight lifters can use it to increase their maximised strength. Weight lifters in particular can benefit from creatine because their muscles are subject to intense stress which increases the demand for creatine. Fruit juices are ideal for aiding the body and muscle cells in absorbing creatine powder. The injection of insulin brought about by the fructose transports the creatine directly into the muscles. It is best to take creatine powder before exercise because of its immediate availability in the body. Combining creatine powder with other dietary supplements also works wonderfully. Create magical shakes for post-training muscle building with creatine powder and whey protein - let your imagination run wild. It is also important to take creatine powder on non-training days. Only then can the body permanently replenish its creatine phosphate stores and provide the necessary energy for an intense workout. The best time to take creatine is in the morning, because the body is also very sensitive to insulin at this time and can swiftly transport the creatine to the muscle cells. Learn more about taking creatine. An adequate intake of fluids is of primary importance when taking creatine on a regular basis. You should drink no less than 2 - 3 litres of water per day. Rare side effects may include nausea, flatulence or diarrhoea - but these usually only occur at high doses or during the loading phase, in which large amounts of creatine are taken over a short period. Water retention can also cause the muscles to appear to "bulge" – a desirable effect. Added to that the advantage of increased power in training. We strongly advise following the recommended dosage to avoid an overdose. Excessive doses can cause damage to the kidneys or muscle cells. Individuals with pre-existing kidney conditions (renal dysfunction) should avoid taking creatine powder. What should you look out for when buying creatine powder online? Good creatine contains the premium-quality raw material Creapure. Creapure® is the purest form of the premium raw material and has been awarded various quality labels. By contrast, a large number of online retailers offer inferior creatine monohydrate from Eastern Europe or China, which cannot compete with the quality standards set by German Creapure®. 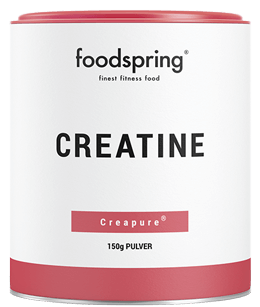 Creatine powder by foodspring is made of 100% German Creapure® and contains no artificial ingredients. You can buy high-quality creatine powder right here in our online shop. Generally speaking, you can take creatine indefinitely. If you do not want to do that, you can try a 12-week cycle, followed by an 8 or 10-week break. Creatine Powder will be back in stock shortly.